In which areas of law does the Firm practice? 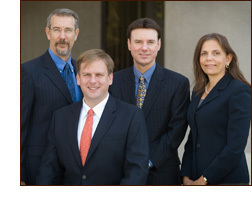 The Williams Firm provides legal services to its clients in the areas of business transactions and litigation, corporate law, intellectual property agreements and disputes, technology transactions and litigation, real property transactions and litigation, construction transactions and litigation, insurance coverage and litigation and banking law. In order to see a more detailed description of the Firm’s services, visit our Practice Areas Overview page. The Williams Firm typically charges for its services based upon the current hourly rates of its attorneys. In some instances involving transactional matters, the Firm may be able to provide a flat fee for simple agreements or transactions. If you would like more information about our current hourly rates or other fee arrangements, please contact the Firm. The Williams Firm is located at 1850 Mt. Diablo Boulevard, Suite 340, Walnut Creek, California 94596. How do I find out more information about the Firm? Does the Firm charge for its initial consultation with a prospective client? If the client’s matter is within the Firm’s areas of expertise, the Firm will provide a free initial consultation for the first one-half hour of a meeting with one of the Firm’s attorneys. Thereafter, the prospective client will be charged the Firm’s current hourly billing rates. How do I become a client of the Firm? In order to become a client of the Firm, it would be necessary for you to meet with one of the Firm’s attorneys in order to determine whether we may be of assistance concerning your particular matter. Thereafter, if the prospective client and the Firm reach an agreement concerning the representation, an Attorney-Client Fee Contract would be signed by both the Firm and the client. The Firm requires a retainer deposit or the payment of a flat fee in advance of the commencement of any work on the matter. If I am a client of the Firm, how do I know the status of my legal matter? The Firm’s attorneys communicate with their clients on a regular basis in order to exchange information and develop approaches to the disposition of the client’s matter. This requires the Firm’s attorneys to be readily accessible to meet and confer with the client. It is the policy of the Firm to provide copies of all relevant documents concerning the matter and to promptly communicate with the client concerning material matters involving the representation.